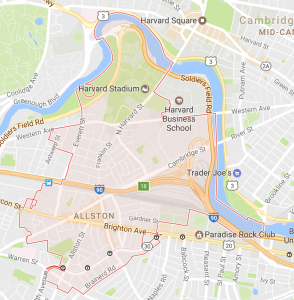 Most well known for its student and young professional populations due to the proximity to many colleges and universities, Allston is one of Boston’s most interesting areas. With known streets such as Harvard Avenue, Commonwealth Avenue and Brighton Avenue, Allston hosts many ethnic restaurants and shops and local venues, making for a very diverse area. Neighboring towns include, Brighton, Brookline and is also bordered by the Charles River. This city is quiet and has a low crime rate; making it a great spot to enjoy all of the amenities of Boston, without being too pricey. While it’s a great place to be, Allston has narrow streets and unique challenges when it comes to removing junk and furniture. With most residential apartments and homes being rented out, there is always a steady stream of people trying to dispose of their old things and landlords needing home cleanout services. One Call Junk Haul has been providing our junk removal and cleanout services to the Allston area since 2011. With our past experience in the area, we can get in, get out and get the job done right, plus it is like we were never there! Contact a Junk Removal & Residential Cleanout Specialist in Allston, MA Today! For reliable junk removal services for the city of Allston, MA, give One Call Junk Haul a call! Our services include residential and commercial junk removal services. Contact us today and book your free estimate now with no obligations by clicking the button below or calling (978) 558-0037!